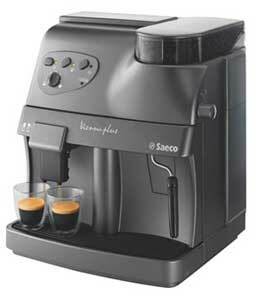 Saeco quality at an affordable price, the Vienna Plus Graphite from Saeco provides ease of use and modern looks in a fully automatic espresso coffee machine. Grinds, measures, tamps and brews great coffee or espresso at the touch of a button. At 1st In Coffee we feature the Saeco Vienna Plus Graphite Super Automatic and a full line of Jura Capresso espresso machines. espresso beans, espresso machines, coffee grinders, frothers and the finest espresso beans – illy and Lavazza.